14″ x 16″ signed Henk Bos. Buyer pays for shipping. The artist Hendrik Bos better known as Henk Bos was born in 1901 in the small town of Huizen in the North province of Holland. Bos was the son of a shoemaker’s servant and was inspired by the century’s of beauty all around him. The young Bos developed a talent for painting still lifes in the style of the Old Masters. 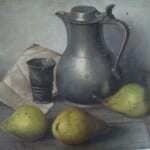 Later while in America he was recognized for his still life work. 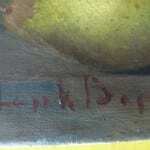 He became known and was even called the “New Rembrandt from Holland”. His artwork is heavily indebted to the more traditional still lives of the Old Masters and displays characteristics typical of this genre of painting. 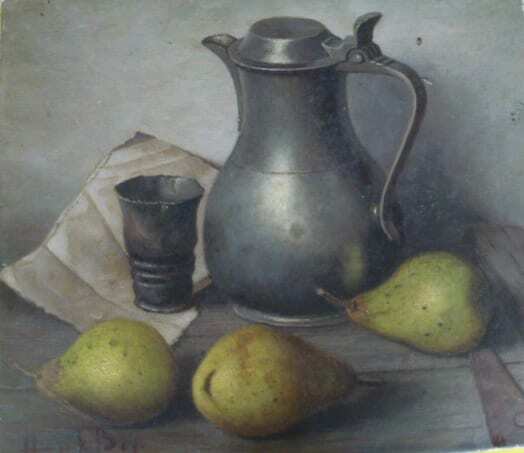 His use of rich colors and ripe fruit with a polished pewter tankard were typical of his subject manor. His work is unusual for its “traditional” aspects that go against the rest of the art world at the time which was much more interested in avant-garde art that embodied the modern condition and techniques of the day. Much of the work of Henk Bos is still in America and continues to be present in fine galleries, and collections. Several museums including the Maryhill Museum of Art and Netherlands Institute for Art History have exhibited his work in their permanent collection. His work has been reproduced and made into prints, and other decorative pieces and the popularity continues today. Henk Bos passed away in 1979.